A really gorgeous bedspread by Sashi with a new england feel. This patchwork quilt cover will brighten up any bedroom with it's squares of blue gingham, blue flowers, bule and white stripes and checked patches. 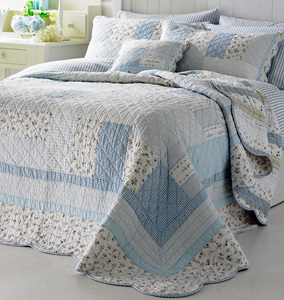 The curved blue and white checked trim finishes off the quilt nicely, a chic vintage item for girls and teenagers.